This is the story of one man’s lifetime dream – come true. I finally learned the hard lessons of imperfect tries, and lifted the phone to make that first call. It took almost 40 years for me to gain the sense necessary, followed by one of the longest waits of my life -six months- until my dream-gun rested in my hands. Was it worth it? A small circle of excellent people, people who I call friends, helped me to realize a dream. Yes, it was worth it. I am many times blessed, indeed. While the elegant classic Colt 1911 on these pages represents a tangible final product, a “period” if you will, on my own dream, it also represents what might be. More than simply a statement about a certain piece of steel and ivory that weighs “so” many ounces and shoots “this” size group, this story is about the fact you can do it too. Consider this, then, as motivation, as an example of the fact that yes, Virginia, there is a Santa Claus, and he may just reside inside of you. It might be time to put away doubts, table the practical side of things and, simply put make it happen. I hope this masterfully-engraved beauty stirs your heart, and puts your own thoughts into gear. “Roy, did you know we’re making classic 1911 slides and frames now?” It was Gary Smith, of Caspian, on the phone one morning. “They are pretty-much dead-ringers for say, a Colt from around the “teens”. I could tell he was smiling on the other end of that call. He had just pressed my button and he knew it. “I’ll send you a photo so you know what I’m talking about.” He had me and I just knew he was grinning. If you’re reading Handgunner it’s probably safe to say your heart beats just a tad faster when you see a mint-condition Colt 1911 from the early years. Few things in a handgunner’s life can make their blood as warm as the sight of an unblemished original, factory blue, every line perfect, 1911. I know you know what I mean, and this was what I was looking at. Well, almost. But I could see what those parts could become. The problem with an original gun is two-fold. First, they cost as much as small car and second, even if you found one, the last thing you’d want to do is engrave it or otherwise fuss with it. You probably wouldn’t even shoot it although you’d sorely want to. And here, before my eyes, was the answer to my dream gun. I’d always wished some aged relative would pass on and leave a mint condition, early model Colt 1911, engraved exactly how I wanted it, with grips exactly how I wanted them, with a few, carefully chosen accessories, exactly how I wanted them. Of course I don’t have any relatives meeting that description. Yet, all was suddenly possible now, in the wink of an arriving e-mail. I know Gary was waiting by his phone, because he answered on the first ring. 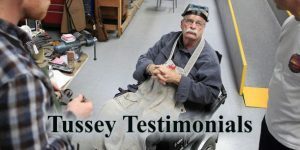 Terry Tussey, that irascible, talented pistolsmith, agreed he wouldn’t talk to me again if I let anyone else build the gun. “So, you’re finally going to do it?” he asked. I had spent hours (days?) 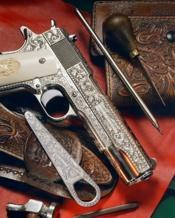 lamenting the fact I had no engraved guns and had wanted one my entire shooting life. “Well hell, why don’t you just do it?” he used to say. I could never figure out just why I didn’t. Probably the same way you can’t figure out why you haven’t. “So can you?” I asked. Tussey let out that patented Tussey-sigh and I could picture him looking over the top of his magnifying visor in semi-disgust. “Tell Gary to send me the parts and then you stay out of my way.” I did. On both counts. Like a classic, clean ’30s car, Browning’s original 1911 had just the right number of curves and flats to my eye. The improvements made later may have rendered it more shooter-friendly, but nonetheless, detracted from the elegance of the original. Contemplate mag wheels and an automatic transmission on a Duesenberg and you’ll get the picture. This was art-as-pistol and as such, had to be “just so” in order to fill the bill. Tussey understood, but had a trick or two up his sleeve. I asked him for a gun I could shoot, would be accurate and would defend my family if called upon to do so. He gave me that “What are you, stupid?” look as if to tell me “Why would I deliver anything other than that, anyway?” Sorry, Terry. Time passed. Terry phoned. 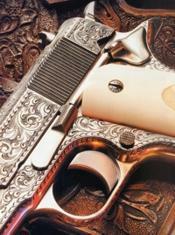 “I got the gun from the engraver. It’s done,” he said. Just like that. “Do you want me to send it on down?” I managed to squeak out a question, “How is it?” “Well, I gotta tell you, it’s a pretty nice gun, I’d say,” Terry said, in that same, “What are you, stupid?” voice of his. I could tell, though, from Terry’s voice, he was impressed. And he’s never impressed. The gun arrived. I had to sit down. I had to sit down for a long time. I got some cold water, splashed it on my face, then sat down some more. When my heart calmed, I looked again. It was all I wanted, expected and wished for. It was a dream, but I could hold it in my hand. I felt like a kid and that first, special bike only more, and better and bigger. This was a good thing, indeed. Since I was definitely going to shoot this gun, Terry was concerned about reliability. This was going to be no “gun safe princess,” so the ejection port was lowered ever-so-slightly. You actually can’t tell unless you really know. But it improves things considerably and doesn’t in the least detract from the period look. Thanks again, Terry. Also, modern parts inside assure modern performance and safety, too. Even that Dusenberg uses modern oils and some newly-made parts these days, I’ll bet. If you’ll notice the sights, you’ll think, at first, they aren’t original. While I’ll be the first to say this pistol represents more of a “feeling” of originality, I still wanted as much authenticity as possible. “Those are original sights,” said Terry on the phone to me. “I managed to find some original Colt drawings from the era showing the exact sight you see. They never went into production, but they did in my shop. Exactly one set, for your gun. And don’t let anyone tell you it’s not right, because it is. And, they work just fine too,” he added, insulted I would have questioned his veracity. Oops. The final result feels exactly right in the hand. And, the sights enhance, rather than detract from the feeling. The pistol is tight, locks-up in a way no original Colt ever did, has a crisp trigger and a safety that goes “snick” like all proper government model safeties should. Terry did his magic and I’ll always be indebted. But he knows that. While Terry gave the gun life, John J. Adams & Son gave it soul. “We’d like to make sure this project comes out exactly how you imagine it,” said John Sr. to me in the early days of the process. He asked me what was important to me. I easily replied it was my family, and then he planted the seed of an idea. “Why not carved ivory stocks to commemorate special family memories?” he said. My wife, Suzi, had taken a bison the year before with a black-power Sharp’s rifle and only just before the project took root, my daughter had taken a nine-point Texas Whitetail buck. “Can you carve a bison on one panel and a white tail on the other?” I asked. John thought it a wonderful idea, and made it so, all on beautiful ivory stocks supplied by Dan Chesiak. The right to keep and bear arms has always meant a great deal to me and John said he’d be happy to honor that on the top of the slide. The flying eagle with a banner clutched in its talons, gets the proper message across. My police career is honored with a serial number to match my old I.D. number, and my initials engraved just in front of the rear sight, complete the particulars. John’s talents are obvious in the almost sculpted-look of the engraving, done deeply, so as to show off the scrollwork as the light plays on the highlights. 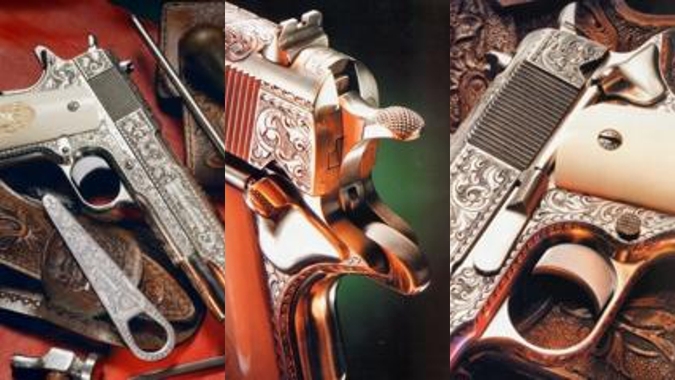 John Jr. added a matching take-down tool, with engraving mirroring the pistol’s. A refined touch if ever there was such a thing. A small “Adams” behind the rear sight and a tasteful “Tussey Custom” on the front-strap pay tribute to the men who made it happen. Absolutely, I shot it. As Terry promised, it ran like a Packard. If you’ve ever started the engine on a 1936 Packard straight eight, you’ll know what I mean. A few turns of the starter, then a quiet rumble that quickly settles into a whisper that makes you lean down to listen to make sure it’s really running. So goes this wonderful pistol. The quiet clack-clack of the slide running on a loaded magazine, the press of a crisp trigger and the satisfying recoil telling you something serious is happening here is exactly how it went. I didn’t measure the groups, who cares, but at 15 yards or so, they hovered around the center of the target and could have been easily covered with the bottom of a coffee cup. I was shooting standing, two-handed, a “stand-up” kind of a gun. Terry said it would deliver an inch at 25 and I believe it. I was grinning, almost laughing out loud. Why did I feel so good? You probably know. If you want your own dream, you know where to start. Yours might be in blue, and not engraved or anything else you can imagine. I’m sure the League can handle it. But mostly, just do it. For more information contact: Caspian Arms Ltd. P.O. Box 465, Hardwick, VT 05843, (802) 472-6454, www.caspianarms.com. Tussey Custom, 24 Moonlight Road, Unit #A, Carson City, NV 89706 (775) 246-1533; ttussey45@aol.com. Adams & Adams Engravers, 7040 VT Rt. 113, P.O. Box 66, Vershire, VT 05079; (802) 685-0019; www.vtgunsmiths.com. 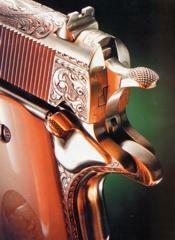 Mike Morgan Engraver, 7549 Porter Road, Dixon, CA 95620; (707) 693-1000.